Greece’s public prosecutor claims the neo-Nazi Golden Dawn party bears all the characteristics of a ‘criminal organization’. Party members stand accused of murder and other acts of violence. Will Greek officials soon move to ban Chrysi Avgi? The 697-page report from the public prosecutor’s office reads like a thriller. But it addresses things that people in Greece long would have considered inconceivable. It paints a picture of a neo-Nazi party that is both openly and forcefully attacking the democratic system in a way not seen in Europe in decades. Directly or indirectly, the report accuses 69 members or supporters of the Chrysi Avgi, or Golden Dawn, political party — among them 16 members of Greek parliament — of participation in murder or attempted murder, serious bodily injury, violent hate crimes, theft, blackmail or arson. Chief Prosecutor Isidoros Dogiakos describes in meticulous detail the structures of a criminal organization that is being directed from inside the Greek parliament. The decisiveness with which justice officials in Greece are now pursuing the extremists is new. For some time, politicians and police shrugged off attacks perpetrated against foreigners, gays and critics as the isolated actions of confused individuals. But the increasing brutality of the attacks led to a shift in thinking, with the turning point coming with the murder of anti-facist rapper Pavlos Fyssas one year ago. As examples, 11 particularly vicious acts of violence are listed. In addition to murders and attempted slayings, they include attacks on foreigners and left-wing activists. In June 2012, for example, the investigators state that a group of Golden Dawn thugs attacked a house in Perama, an Athens suburb, in which four Egyptian fishery workers were staying. The right-wing thugs seriously injured one of the men and forced the others to flee. One year later, they attacked communist labor union members in the same town. In Vainia on the island of Crete, thugs armed with lumber beat several Pakistanis in their home. For the most part, Golden Dawn’s “storm troopers” carry out these attacks in a manner reminiscent of the Nazi SA. Their members usually wear black uniforms and helmets and also carry clubs or similar bludgeons. Investigators with the public prosecutor’s office also found that the storm troopers are given special training comparable to that given to “elite units in the armed forces.” Party boss Michaloliakos, who is called the “Führer” inside the party, a clear reference to Hitler, is fond of describing the storm troopers as his “disciplined army” and “iron column”. Thuggish right-wing extremist groups exist in other European countries as well, but what makes Golden Dawn stand out is that it has now been represented in the national parliament for two years. Prior to 2012 Greek parliamentary elections, the party had been a splinter group that wasn’t taken seriously politically. In October 2009, it garnered a meagre 0.29 percent of the vote. With so few votes, why would anyone have bothered to get worked up when Golden Dawn’s “Führer” openly proclaimed his admiration for National Socialism? At the time, though, now one was paying close enough attention. Then the debt crisis arrived. The Europeans intervened with a tough austerity measures and, paired with a dramatically rising unemployment rate, the neo-Nazis became increasingly popular. Many protest voters among mainstream conservatives and people who had suffered as a result of the crisis voted for the party. In June 2012, Golden Dawn entered into parliament for the first time, winning 18 seats. Even today, the party is still polling as high as 15 percent in surveys. All at once, the neo-Nazis had become elected politicians. They also carried out what they had pledged. “Using the protection provided by their parliamentary immunity,” the investigators write, Golden Dawn began organizing street fights. The number of attacks committed by storm troopers and motorcycle gangs quickly began to grow. Prosecutors also claim that members of parliament often showed up in courts or police stations to “help arrested offenders.” They also voluntarily permitted themselves to be filmed, which has now come back to haunt them. In addition to weapons, investigators have also seized videos, television recordings, photos and text messages. Investigators are also reviewing the contents of wire-tapped telephone conversations and testimony from witnesses. The September 2013 murder of left-wing singer Fyssas provides but one example of the right-wing thugs’ highly organized approach. Investigators found that they had been observing the well-known rapper as he watched a football match at a pub in Piräus together with friends. The extremists alerted their storm troopers by text message and as Fyssas and his friends left the bar at midnight, “a group of 30 uniformed people with lumber beams” were waiting for him, according to the report. Abuse and a scuffle ensued and ended in murder. “As two to three members of Golden Dawn hit and held Pavlos Fyssas down, Georgios Roupakias stabbed him twice in the heart and once in the leg,” the report claims. 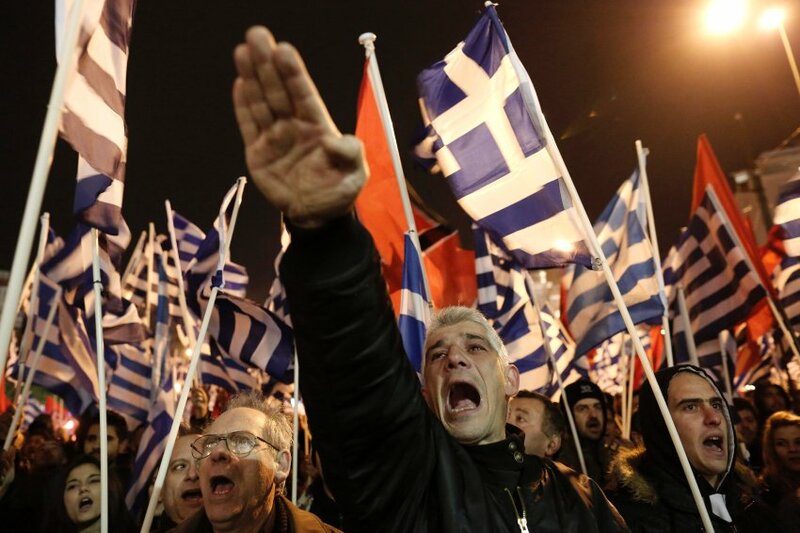 Police arrested Roupakias, who readily admitted he was a member of Golden Dawn. A witness would later claim that a “central order from member of parliament Ioannis Lagos,” had been given to fellow party members to “finish” the musician, “wherever you can find him.” The report claims that the attack took place with the knowledge of Golden Dawn’s spokesman and the permission of its “Führer”. The fact that the neo-Nazi mob could unleash its wrath for so long before the authorities took action is also the product of close links between state security forces and politicians. Party spokesman Kasidiaris, for example, was fond of calling up the government administration when he needed political advice. The neo-Nazi even sought the advice of former cabinet secretary Takis Baltakos on voting positions on controversial issues. He also got support from the politician when the public prosecutor began investigating Golden Dawn. During a meeting with Baltakos, Kasidiaris called the public prosecutor’s office a government puppet and also shared disparaging remarks about the chief prosecutor in the case. Baltakos agreed and offered reassurances, according to the report, saying there was “no evidence, nothing.” The intended meaning may well have been: Don’t worry, you have nothing to fear from the government. Baltakos also insulted the prime minister at one point in talks. Kasidiaris had recorded the conversations and eventually went public with them. The right-wing extremists also enjoy a great degree of sympathy among security forces. In special polling stations for police officers, the party faired significantly higher than the national average, receiving 20 percent of the vote in some places. Many civil servants were members of the party and took part in the Golden Dawn’s right-wing activities during their spare time. Meanwhile, a report by the Office of Internal Investigation, that has been handed over to the public prosecutor’s office, documents the close interplay between police and extremists in 130 instances. The examples show that, in many places, police systematically refused to accept complaints filed by foreigners and that they were at times paid by Golden Dawn not to do so. The document also shows how police officers racially disparaged refugees, looked away during attacks against them or even took part in them outside of working hours. At the Amygdaleza prison, one employee, working on behalf of Golden Dawn, was even documented as beating foreign inmates. SPIEGEL has also obtained the list of this and similar offences, which is both long and disturbing. 08/11/2014 in International, Δίκη Χρυσής Αυγής.